Get the scoop on the best kid-friendly apps iPad has to offer! How do you find good apps for your children? Read iPad Apps For Kids For Dummies, that's how! With over a half-million apps in the App Store and that number growing, this great new guide cuts through the clutter and points parents in the direction of the best apps for kids of all ages. From apps for dinosaur lovers to fashion fans, puzzle masters to avid adventurers, and everything in between, you ll find apps to both educate and entertain. Which apps have strong girl role models? Which apps help kids with special needs? Which ones will keep the whole family entertained on the road? This handy, full-color book by tech-savvy, USA TODAY Kid-Tech columnist Jinny Gudmundsen covers it all. * Helps parents find the best of the best iPad apps for children of all ages in the crowded App Store * Shows parents which apps are worth the price and those that are free and fabulous * Demonstrates how to use an iPad to make learning fun, apps for kids with special needs, age-appropriate apps for each child's age, and how you can avoid in-app purchase mistakes * Draws on the experience and expertise of Kid-Tech columnist Jinny Gudmundsen, who has taken countless apps for a test run and shared her findings in USA TODAY and in Gannett newspapers nationwide; Jinny's work has also been published in the Los Angeles Times and Child magazine, and online at ABCNews.com, and she has appeared on national TV and radio Don't waste anymore time plowing through the App Store for kid-friendly apps on your own! 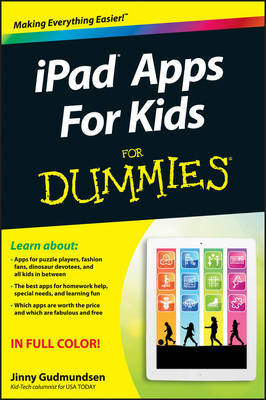 Get iPad Apps For Kids For Dummies today and get your kids excited about learning.